If you’re an experienced power user, you should already know what’s safe and what isn’t when it comes to downloading and installing apps. 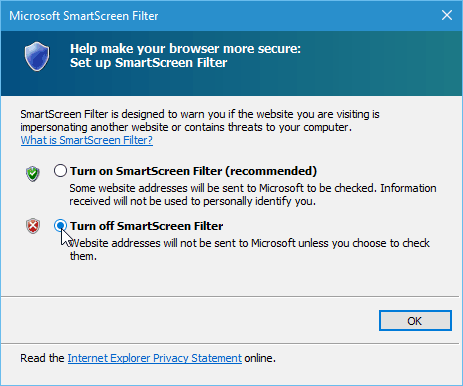 SmartScreen is a security feature that was introduced in Internet Explorer 8 to help protect against malicious websites. In Windows 8.1 it was introduced to the desktop level and warn you before running unrecognized apps from the Internet that could potentially be unsafe. This security layer is built into Windows 10, too. If you’re an experienced power user, you should already know what’s safe and what isn’t when it comes to downloading and installing apps. So, you don’t need the annoyance of the SmartScreen filter always popping up when you’re about to install something. Important Note: If you’re new to Windows 10 or a novice user, I recommend not turning off SmartScreen. It does help protect you from installing malicious software. 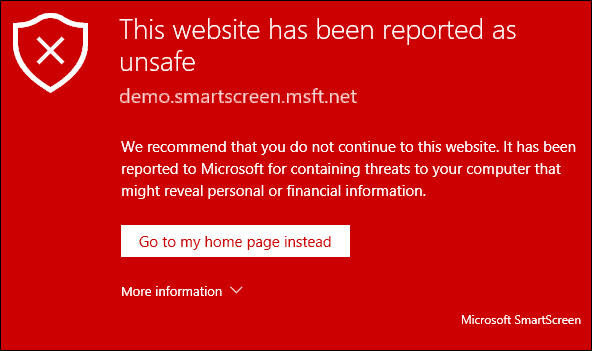 Also, Microsoft has improved the SmartScreen Filter in Windows 10 to integrate with Microsoft Edge and IE 11 to help keep you safe from malicious websites. The shot below I received the other day when I was about to install VirtualBox. When it appears, it’s just a matter of clicking the “I agree…” box and the “Run anyway” button. However, when I’m trying to be productive and set up a new PC, it slows down progress and is just plain annoying. The neat thing is you can turn it off. To do that, bring up the hidden power user menu and open Control Panel and select Security and Maintenance. Or, you can click Start and type: security and maintenance and select the result from the top. Now click Change Windows SmartScreen settings. Now you have three options, keep it on with admin approval to allow running the app (the default), warn about unrecognized apps but not require admin approval, or turn it off completely. When you turn it off, right away a notification will pop-up telling you how unsafe you’re being. 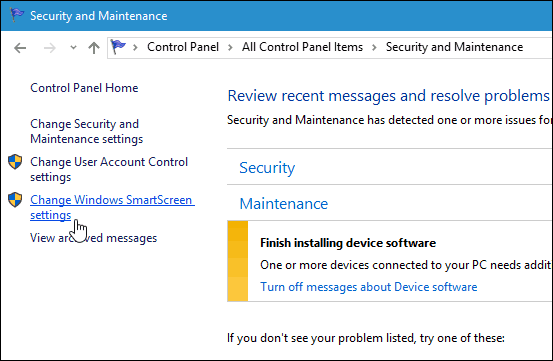 But, if you don’t want to be nagged about the fact you turned SmartScreen off, click Turn off messages about Windows SmartScreen under the Security section. Personally, I find SmartScreen to be most annoying when installing desktop programs, and not so much with the browser. If you’re an IE or Edge user, it’s probably best to leave it on. Even the most seasoned techie can accidentally click a malicious link or ad. But you can turn it off if you want. 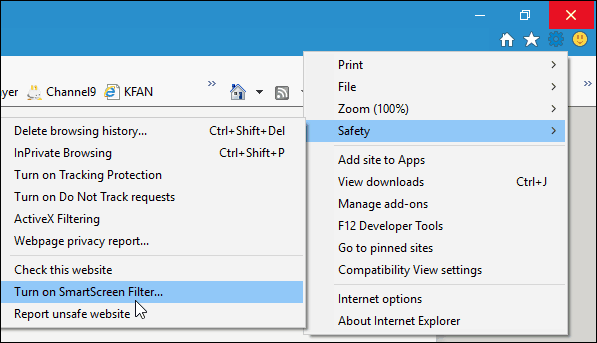 In IE 11 click Settings (gear icon) > Safety > Turn on SmartScreen Filter. Then select the option to turn it off and click OK.
Microsoft Edge makes turning it off a bit easier. Open Edge and go to Settings > View Advanced Settings. Then scroll down to the bottom under Privacy and Services and turn off Help protect me from malicious sites and downloads with SmartScreen Filter. In fact, if you are having a problem downloading a valid file, one of the troubleshooting steps we cover is turning SmartScreen Filter off. You can find out more about download issues in our guide: How to Manage and Troubleshoot Downloads in Windows 10. Remember, if you’re not bothered by the SmartScreen messages and want to keep every security advantage you can in Windows 10, just leave it on. If you have kids, parents, or grandparents running Windows 7, 8.1, or 10 – leave it on for the desktop and definitely in IE 11. 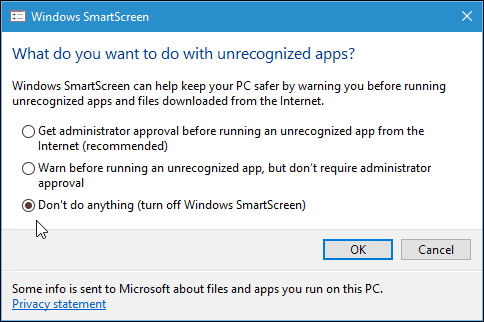 For those of you who know what you’re doing, it’s nice to stop SmartScreen from popping up when you install software that you know is safe. Especially Open Source programs and other utilities. You can always turn it back on again if you think you’ll need it. Is it okay to run windows smart screen and mcafee live safe at the same time? By default, Smartscreen reports every application that you launch — even Microsoft apps that shipped with the OS. (You can see this with Malwarebytes Firewall.) On my copy of Windows, you cannot limit this monitoring to installers or the first run for new applications — and Windows does not ask permission before it reports your activities. The absence of transparency and control on this platform demonstrates that the primary purpose is surveillance, not security. Yes it certainly would be “neat” if you could turn SmartSurveillance off. But on my copy of Windows, that is not possible because “Change Windows Smartscreen settings” does not appear as shown in the illustration. And that’s just the tip of the iceberg where unauthorized telemetry is concerned. I am sick of this battle with Microsoft to regain control of my computer: time to switch to Ubuntu.